Paychex, Inc., together with its subsidiaries, provides payroll, human resource, and benefits outsourcing solutions for small- to medium-sized businesses in the United States and Germany. This dividend achiever has raised dividends for 19 years in a row. Over the past decade this dividend growth stock has delivered an average total return of 3.70% annually. The company has managed to deliver a 12.60% average annual increase in its EPS between 1999 and 2008. Analysts expect Paychex to earn $1.33 share next year, followed by an 8% increase to $1.44/share in the year after that. 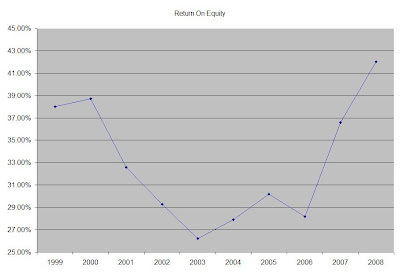 The Return on Equity has recovered from its 2002-2006 lows and is at a very impressive level at 42%. This is especially positive given the fact that the company remains virtually debt free. Rather than focus on absolute values for this indicator, I generally want to see at least a stable return on equity over time. Annual dividends have increased by an average of 23.50% annually since 1999, which is higher than the growth in EPS. A 24 % growth in dividends translates into the dividend payment doubling every three years. If we look at historical data, going as far back as 1990, Paychex has actually managed to double its dividend payment every two and a half years on average. 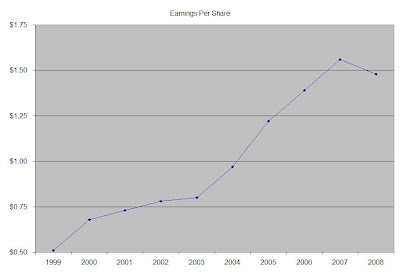 The dividend payout ratio has more than doubled from 35% in 1999 to 81%. The company’s dividend payment looks unsustainable, given the slow expected growth in earnings over the next few years. This could not only hinder any near term dividend growth, but also could place the dividend in danger of a cut. The solid dividend growth over the past few years did not come from EPS growth but mainly from expansion if the dividend payout ratio. In addition to that the company failed to increase dividends in July, which marked the fifth consecutive quarter of unchanged distributions. A lower payout is always a plus, since it leaves room for consistent dividend growth minimizing the impact of short-term fluctuations in earnings. Currently Paychex is valued at 18.70 times earnings, yields 4.40% and has a dangerously high dividend payout ratio. I view its closest competitor ADP as more attractively valued of the two. ADP is larger, has a more diversified business base, its dividend still has room to grow and is adequately covered by earnings.